Technology allows for an unprecedented level of synergy between various building systems, offering efficiencies and new capabilities. An opportunity to increase productivity through collaboration lies in the ability to schedule gathering spaces appropriate to the size and needs of the team and then use the data to fine-tune facility efficiency. Boston-based technology firm Salsify uses the data from its scheduling system to verify that meeting room ratios function as they were designed and ensure that the quantity of rooms per size are aligned with utilization. “Since the system offers historical data, we can look back and compare what usage used to look like when we first moved in and what it has changed to now,” says Stephanie Peters, who manages culture, employee, and office experience at Salsify. Not only does the company maximize the use of meeting spaces, but by analyzing the database, the facility management team can identify trends and patterns in utilization, which allows them to know how and when they should reconfigure their space to assure maximum responsiveness. As Salsify prepares to move to new headquarters in August 2018, the company knows that the new space will fit their work patterns with precision, eliminating waste and promoting full-throttled collaboration. • Some systems gather data that allows users to track and understand patterns of interaction. Technologies like Rifiniti and Humanyze are “people analytics programs” that track how and where workers engage each other, with the goal of providing information on how best to plan for the most effective strategic adjacencies. • We’ve all looked up at office towers at night, seen the lights blazing on empty floors, and wondered why all that energy is being wasted. Often the answer is that they need to be illuminated for the cleaning crew. The more fundamental answer is that the building does not have a sufficiently sophisticated lighting control system to dynamically modify the light fixtures. According to National Grid, 35 to 45 percent of an office building’s energy cost is due to lighting; the potential to save energy and money by turning off unnecessary lights is enormous. Companies are moving beyond just code-mandated occupancy sensors in offices in favor of control systems for open office areas too. As systems become even more refined, applications like Comfy, which was recently acquired by Siemens, allow users to adjust light levels to their individual preference. The Comfy app, which started out as a way to reduce hot and cold complaints, now also allows users to find and book available rooms and desks, and share immediate feedback with workplace teams. • User comfort has always been of great concern to building managers. One person’s hot is another person’s cold. Not only do new energy management technologies allow for more efficient heating and cooling, but customized area controls are becoming more available. CrowdComfort, for example, allows individuals to use their smartphones to communicate with building management directly, facilitating micro-adjustment of systems to user preference, as well as smooth dialogue with building engineers. • Security is of ubiquitous concern, for reasons related not only to life and physical property safety but also protection of intellectual property. Immediately post-9/11, reception desk greeters became security guards and front doors became entry gates. Nearly everyone now has a smartphone, which can be readily programmed with owner identification. Mobile access control has the advantage of simplified and centralized credential management, and offers the benefit of full data gathering and analysis. Knowing who enters and leaves a building — and when — can tie directly into a better understanding of how much space is really needed. An increasingly mobile workforce does not operate according to the more traditional 9-5 schedule; thus, the amount and location of required space must be more deeply scrutinized. 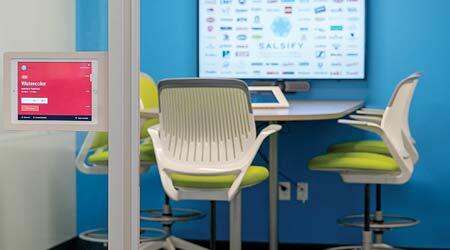 • Audiovisual systems have become the mainstay of collaboration. Few meetings in the knowledge economy are conducted without technology support, and screen sharing has become universal. Confirmation that the right AV is available for the meeting size and purpose is one of the functions of companies like TEEM, a software that not only schedules rooms and equipment, but simplifies the sharing and display of information. Finally, there are applications that interface with services and vendors inside and outside the office building itself. Corporate cafeterias often now support the ability to order food via an app, either for individuals or catered groups, in advance of the rush-hour pickup. Many new dining facilities offer state-of-the-art software capabilities for viewing and ordering customized selections from any of the variety of their culinary options. Other services ready to ride this technology wave may include dry cleaning, health and wellness services, day care scheduling, and access to other amenities.